I don’t know about you, but I am absolutely dreading the SR 520 bridge toll. The peak hour rate is set at $3.50 each way. As a Seattle resident who works on the Eastside, I can think of a million things I would rather spend my $140/month on other than toll fees. What’s your plan? Will you continue to drive to and from work? For those of you who live and work on the Eastside- will you travel to Seattle as often? There are several bus lines that run between Seattle and the Eastside via SR 520. Sound Transit express routes 540, 542, 545, 555, 556 will get you across the bridge. Head to Sound Transit’s website for time schedules. King County Metro has several routes that will take you across the bridge too. 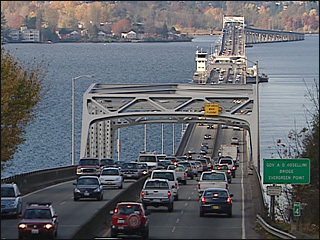 Take a look at King County Metro’s page which lists all of the routes servicing the SR 520 bridge, as well as some additional commuter resources that you might find useful. Each way is $2.50, which is only $1 less than the scheduled tolls. However, if you purchase an ORCA card, you can ride the bus for $90/month. I have been practicing my bus riding skills by taking the 542 to work here at thinkspace. We are fortunate enough to have the Redmond Transit Center only 200 feet away from our building! Do you live on the Eastside but work in Seattle? Talk to your boss about working at our office here in Redmond. Save time and money by eliminating your commute. We officially opened our new Redmond coworking space in February. What exactly is coworking? Picture a desk, chair, lightning fast Internet, a LEED certified work environment, and a room filled with like-minded entrepreneurs, business professionals, and tech startups. Sure, you can work at home with all of those distractions. Or, you can head to your local coffee shop and have Internet issues. Why not give coworking a try? Come check us out, your first day of coworking is on us! If you are interested in learning more about coworking and locating other coworking spaces check out the Seattle Coworking Wiki. Why do all of the fun networking and education events always happen in Seattle? With the upcoming SR 520 tolls, my goal is to create a stronger event presence here on the Eastside. Redmond, WA is filled with brilliant individuals and inspiring entrepreneurs. Therefore, we should be channeling this energy right where it belongs, at home here in Redmond! At thinkspace, we are fortunate enough to have the space to host events. So, next time you’re thinking of hosting an event, feel free to drop me a line- Kristin [at] thinkspace [dot] com. As thinkspace’s Community Marketing Manager, I am always looking to meet interesting individuals, engaging groups of people, and fun events to bring to our community. Although I hate the idea of paying $3.50 to cross the bridge to work everyday, I am inspired by the opportunity of what can be created here in Redmond. I am asking for your support, passion, feedback, and ideas. UPDATE: We’re now featured on King County Metro’s SR-520 Travel Options page for our coworking space- take a moment to check it out. Thanks Kristin for the insight and open discussion….great to know people are engaged in this debateable arena. As a kid, I remember hanging out the window throwing money 10 cents, into the cup as Mom drove us by the toll booth, durring the early 70’s. Then celebrating as we tax payers paid off the bridge and the toll booths went away. BUMMER…they are back again! Never did I anticipate this span to be a toll bridge again. Thanks for your comment! And I agree, this has been a topic that’s been top of mind for me lately. It will be interesting to see how traffic and commuting behavior shifts! If you are interested in coworking in Seattle I recommend checking out Office Nomads- it’s a very well established coworking space in Capitol Hill! Also, if you’re commuting to Redmond specifically, the city has an awesome program called R-Trip for commuters who either live in Redmond or work in Redmond. They will send you a one month free bus pass, or 20 free bus tickets. I did that my first time commuting over 520 via bus. I hear you though, I’m in the same boat! Let me know how the 520 tolls change your commuting experience. James Bond Aston Martin DB5 revoloving license plates. Hey! Now there’s an idea. I hate this toll idea. Riding the bus is not getting any cheaper or faster. I live in the south-end so I90 going to blow.